Giroud: Is He Good Enough? 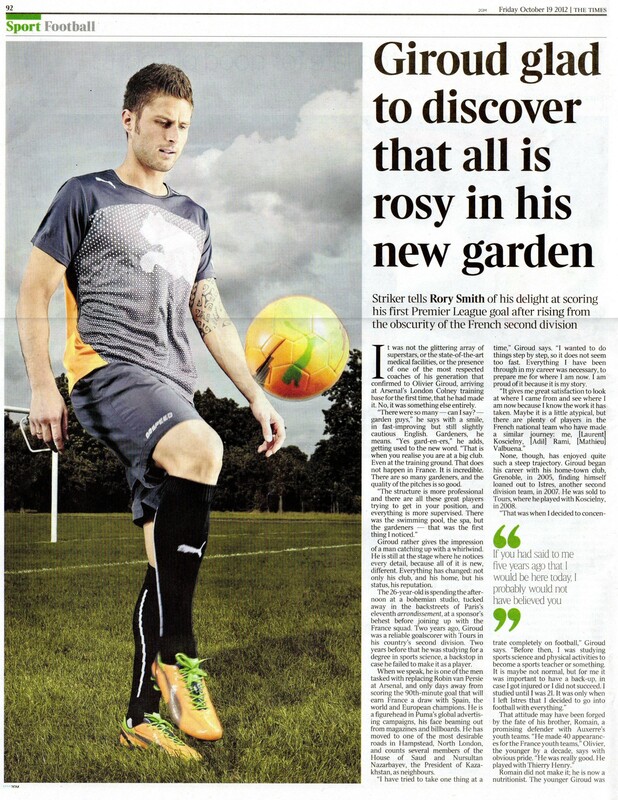 Here’s a feature on Olivier Giroud from The Times last Friday. Last Friday, of course, things looked a bit rosier for Gooners than they do now. Since then we have had two defeats where we managed one shot on target, a speculative effort from a 17-year old sub in injury time of the second game. This is not really Giroud’s fault of course. For the Schalke game he came on as a late sub and was provided with little or no service. He’s not a Walcott, who comes on to best effect against tired legs – the only tired legs last night seemed to be in the Arsenal team. Giroud needs time to get into a game and make his presence felt against the defence, preferably with the help of a few well-aimed crosses. But enough of the depression of recent matches, what does M Giroud have to say for himself in The Times, and what do they conclude about him? We learn that he was impressed by the magnificent facilities of London Colney, with its dozens of ‘gardeners’ tending the immaculate pitches. In France his face is all over billboards for Puma; in London he has moved to Hampstead to be neighbours with some of the Saudi Royal family and, apparently, the President of Kazakhstan (who you would think faces quite a long commute to the office from there). 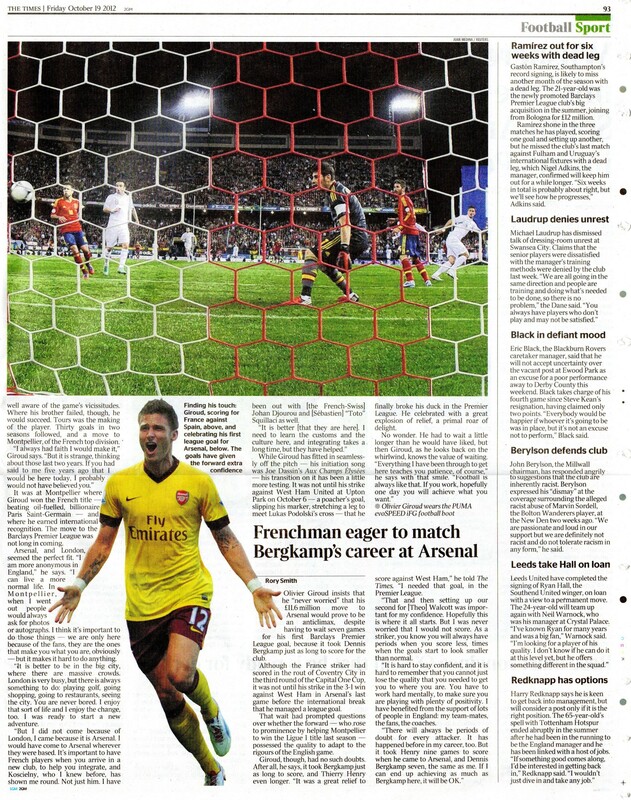 The Times recognises the rather steep recent rise of Giroud’s career, which is probably the thing that worries most Arsenal fans – will his lack of experience at even top level in France mean that he proves not good enough for the Premier League in the long run? Giroud explains that he was not fully concentrating on football until recent years while he completed his studies. His desire for a fall-back career is understandable when his older brother played 40 times for France at youth levels but never made it as a pro, and is now out of the game. We learn little else from the main feature, other than the usual statements from new Arsenal players arrived from abroad: they’re happy some of their compatriots are here already, they like the anonymity of London and they love Arsenal. Below the main feature is a smaller piece headed “Frenchman eager to match Bergkamp’s career at Arsenal”. Naturally the comparison only comes about because of the similar length of time it took the two of them to score a league goal; Giroud is not so daft as to believe he is as good as Bergkamp. Clearly he isn’t. The question remains, though, whether he is good enough for Arsenal. The Times come to no critical conclusion, but I’m still in the camp that believes he can be a useful and effective Arsenal player, but only if we play to his strengths. At the moment our forward play lacks any focus. The defence has improved this season, horrendous individual errors aside, and attack is where the manager needs some fresh ideas. Giroud could be a star or a £12m write-off by the end of the season. I think the conclusion depends a lot more on what Arsène Wenger chooses to do with him and those around him than what he can control himself. Most of the horrendous defensive errors have come from the Captain! Where is the famous Bould miracle now? I think OG will be good enough if he’s given time. These losses are not giving him time. Nope, he is not and will never be, he does not have what it takes. As things stand Giroud fits in perfectly with the rest of this average bunch of no-hopers! And I include Wenger at the top of the list! 8 years without a trophy would have seen him replaced years ago at any truly top club….. but then we cannot count ourselves as that anymore….PHW, Stan K Gazidis and Wenger have seen to that!! It’s a shame that Robin’s sell-off meant Giroud had to be (so to speak) thrown in at the deep end. He should have served his first season here as back-up to the ‘main man’ rather than expected to BE the ‘main man’. It’s the familiar story of the past few years: one step forward, two steps backward. Same with Song: how we could have done with him last night! Now we can choose to believe all the usual ‘promises, promises’ heard at today’s AGM – 2014, FFP, sit with the best, etc – or we can choose to use our common sense and deduce from the evidence available that under the current regime we are heading nowhere. Past experience teaches us that we cannot rely on anything that the current regime says. They are unprincipled – and if anyone doubts that, he should ask himself how any ‘principled’ CEO of Arsenal would justify selling our far and away best player, the top marksman in PL, to Man U. It’s clear that Ivan the Awful has no concept at all of the tradition, history and honour of Arsenal. My faith in Arsene is waning – he ought to have fought his corner, made the sell-off of Robin a resignation issue – and his address at AGM was primarily intended to placate fans – but even so he could not help but reveal that he has no power on financial matters, that he can only do what he can with the ‘resources’ he is given. In other words, the £35m (or is it £70m?) transfer pot available to him these past 7 years has not been spent because, push comes to shove, it does not exist. Which takes us back to Giroud. Lack of (nett) investment means that too much, too soon has been placed on his shoulders. (Let’s pray that doesn’t happen to Jack this week!) Given time OG might turn out to be a very good striker. But then again we have a manager who is and 8 year FAILURE!! How many other truely top clubs would accept this, the answer is none!!! How many more years of going backwards will it take before the truth is seen clearly, we are fast becoming another Liverpool, big in name, small in stature!!! Wengers purchases in the last 7 years have been a list of failures. How many true quality players has he bought in (not counting the few young players developed like Fab, Ox)…. Maybe Vermaelen, Cazorla errrrrr what others? But lok at the list of average dross…. Djourou, Eboue, Santos, Ramsey, Diaby, Arshavin, Chamakh, Fabianski, Senderos, Cygan, Giroud, Gervinho, Bendtner, Vela, stepanov, Mendes, Koscielny, Manone to name just a few …there are countless others!! None of these mentioned and all of the others would not have even made it to being squad players prior to 2004! Wenger was successful only by building on what was already here when he arrived, since he has had to rebuild he has FAILED at every step! Trophies and a winning mentality are what is required, success breeds success confidence and for the club it bring in money! What is not good is not just the being happy at finishing in the top 4 (which this season will not happen – this I m 100% sure of) thuis allows Wenger and the players to continue without the pressure that goes along with being a top club…all other top clubs in the world measure themselves by trophies… not by income…and that is the difference between Arsenal and the way it is run, and all of the other true top clubs!